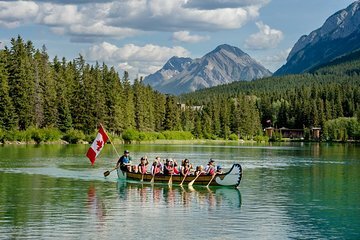 Immergiti nel Parco Nazionale di Banff e ammira il paesaggio dall'acqua in questa avventura in canoa. Pedala lungo il grazioso fiume Bow e ascolta mentre la tua guida getta luce su secoli di storia e patrimonio canadesi. Guarda le sponde del fiume per avvistamenti di animali selvatici nativi, quindi termina il tour in canoa con spuntini leggeri. Amazing and fun Canoe Ride on Bow Rider with excellent Guide Lucy Congrea. Lucy was not only very knowledgeable about the river, the animals and all things Banff but her enthusiasm was what made the tour great. We went as a family with 2 kids a 10 year old and a 5 year old and both were equally entertained and had a great fun time. She made my son who is 5 sit in front and called him Captain which we had to call him for the rest of the day. We also got to see 2 elk with a baby elk, and they even crossed the river which was cool to see. We also saw a muskrat. It was a great tour and I highly recommend it to anyone and especially for families. Ask for Lucy! We had a lot of fun on our canoe tour! We went as part of our honeymoon trip. Lucy was our guide and she was excellent. She shared so much local knowledge with us! very enjoyable and peaceful and beautiful. It was a nice change of pace being on the river. There wasn't anything earth shattering about the tour. You row up river for 30 minutes or so, pull over and look at a few things our guide pointed out and then float back to the start. It was a beautiful day and the trip was fun. Be sure to dress warmer than you think you should as once we turned around the wind was in our faces and I was glad I brought an extra jacket.